A good pickup line will break the ice when you're trying to meet someone you're attracted to. After that, you're on your own so be genuine. Some lines are funny and others should never be spoken out loud. Know the difference! Pickup line? What… is that? Are men still using pickup lines? While dating has positively evolved from what it used to be, their choice of a cheesy pickup line has not. You can be sure a man’s pickup line has failed simply by the expression on a woman’s face after he has spoken to her. When it comes to engaging women, some of us, nevertheless, have a tough time breaking the ice. We become tense and occasionally, the words just don’t come out right. What was to sound inviting now sounds weird and you exposed yourself, having that awkward moment when you know full well you’ve played yourself. There is at least 900 pick up lines and you chose the worst example in the collection. It’s okay… keep reading to get tips on how to deliver a pickup line. The best advice I could give any man or woman is to keep it natural, to be exact and avoid a dirty pickup line, particularly if you don’t associate with that person. However, a pickup line that makes women laugh work the best. Let’s look at a couple of simple-to-memorize phrases that might catch a lady’s attention. Funny pickup line. You should get into character for this one. Joey from the hit show, Friends, did it best. His favorite line and ours, too, is “How you doin’?” If somehow you missed that program, perhaps you tune into the Wendy Williams Show. It’s her intro line as well, but she does it while extending the hands in a downward position. The following phrases from Gotlines.com are certainly familiar, easy-to-master and will presumably get you an answer with a friendly expression. 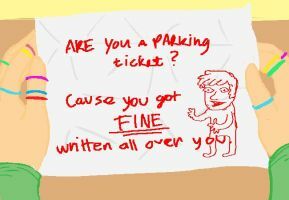 Cute pickup line. Your line should sound natural and not forced. It should not be the first thing out of a man’s mouth, but he should be subtle in his strategy and timing. Although you’ve broken the ice with some really funny pick up lines for girls, women still don’t take you seriously. Could it be that you’re “too nice?” (What is “too nice,” right?) Believe it or not, you could be… for that person anyway. Some women don’t ever respond to the generous, warmhearted man, even though she maintains she longs for one. There may be absolutely nothing wrong with you, but the difficulty resides within the other individual. It’s conceivable the women you’re drawn to fall victim to the wrong men. Not all women are like this, so don’t take it personally. It’s true, women date the wrong men mainly because they are moved by an intense, electrical attraction (lust) to them. In light of this, you may want to use the funny pick up lines for girls who like bad boys or Jamaican men. However, if you’ve attempted that and you’re still not getting dates, you may want to examine yourself and ask a few honest questions. Here are some examples. Are you due for an extreme makeover? What are your key attributes? Do your teeth look like mac and cheese? Are you limiting yourself to one race or kind of person (i.e. slim, curvy girl, cougar? These are all great questions to ask yourself to get to the bottom of why your pick up lines for girls aren’t working. You can’t make no one love you, especially if you don’t love yourself. When you meet someone, who doesn’t want you the same way, accept the fact and move on. Otherwise, you will run the risk of getting hurt. Of course, you could make a nuisance of yourself like the character, Steve Erkel, but in real life, the authorities will arrest stalkers. 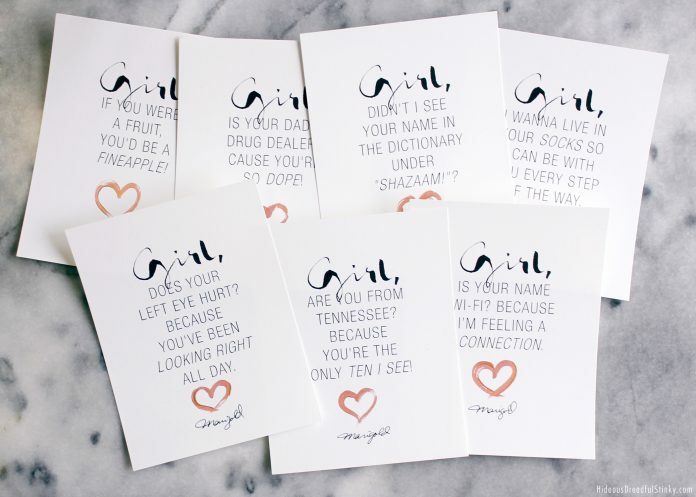 Pick Up Line Cards are great to use to help get over the nervousness around certain individuals from time to time, and others never get used to meeting new people. But when they do, they never seem to have intimate relationships with others. There are definite reasons why this happens and it could be an internal problem. Don’t be afraid to try something new. You might find a part of yourself that’s been hidden. What’s more is you just might like it. Pick up lines will only get you so far. Self-confidence is a major part of developing a relationship and will take you further. Next articleHow to Deal With a Needy Man? Read These Tips and Tactics!